I have to admit, carrots are not my favorite food. I like them roasted and baked into cakes but raw? Bleck. I don’t know how the Easter bunny does it. 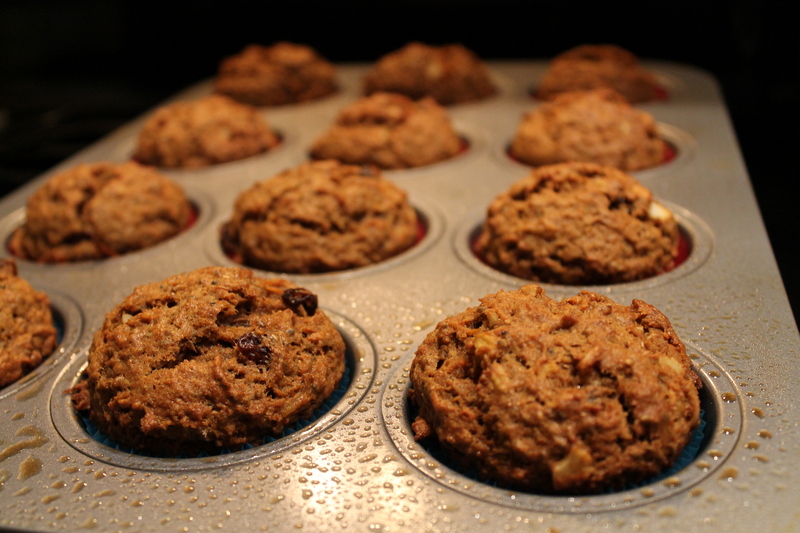 So since that excludes salads and slaws, I picked out a sweet & delicious carrot baked good: morning glory muffins. I used the King Arthur Flour recipe which calls for whole wheat flour, even better! These little guys are absolutely jam packed full of goodness and come together very quickly (after you have grated the carrots and apple….). So let’s get started. Preheat your oven to 375 degrees. Grease 12-15 muffin cups and fill with liners. I got 15 muffins out of this recipe. In a large bowl, whisk together the flour, sugar, baking soda, spices and salt. Add the carrot, apple, coconut, nuts & seeds (if using). In a smaller bowl, whisk together the eggs, oil, and vanilla. Pour the egg/oil/vanilla mixture into the dry/moist ingredients and stir until just combined. 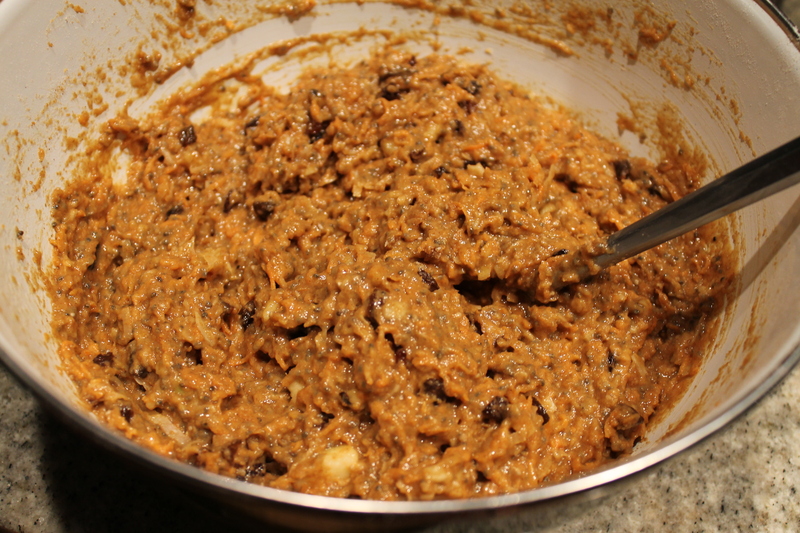 Add the raisins and stir until evenly distributed. This looks like a nasty, inedible mess right? Divide the batter evenly among the muffin cups — it is helpful to use an ice cream scoop for this so all muffins are the same size. Bake them for 20-25 minutes or until a cake tester comes out clean. These muffins are surprisingly delicious — not too sweet, incredibly moist, and super filling. Eat one of these little guys for breakfast and you will be full until lunchtime! This entry was posted in Apples, Brown Sugar, Carrots and tagged apple, breakfast, carrot, King Arthur Flour, morning glory muffins, muffin, snack. Bookmark the permalink.